BUT, AREN’T TANKLESS SYSTEMS EXPENSIVE? This is one of the first things that homeowners bring up when talking about tankless water heaters—the cost. More specifically, people notice that tankless water heaters cost a significant amount more than tank water heaters do, initially. We agree that the cost of any home comfort or plumbing setup in your home should be a serious point of consideration, but we’d encourage you to not just brush off a tankless system due to the installation cost, as there are other factors to consider. Yes, you will pay more for a tankless water heater installation than you would for a traditional storage tank water heater. That’s not a bad thing, however! Why not? Because a tankless water heater is going to cost you less to run over the years, due to its efficiency. More on that below. Energy efficiency is absolutely something to keep in mind when deciding what type of water heater to have installed in your home. No matter how efficient of a storage tank water heater you’d get, this type of system is still subject to standby energy loss. This is when heat from the water inside the tank transfers out into the air surrounding it, which results in the need to reheat the water stored in the tank. Since tankless systems don’t have a tank at all, they avoid this situation altogether. You also have system lifespan to consider. A decent tank water heater will last you around 12-15 years, so long as you keep up on water heater maintenance. That’s not bad at all, of course. But a tankless water heater extends this lifespan into the 20-25 year range. If you’re planning on staying in your home for the long term, then it can definitely make more sense for you to invest in a tankless system versus a storage tank water heater. 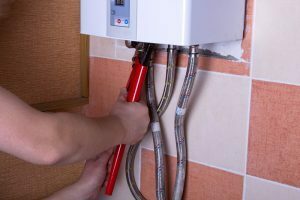 Of course, as we’ve alluded to above, there are benefits and disadvantages to both types of water heaters. Our staff is happy to work with you in determining what system is best for your specific home and needs.